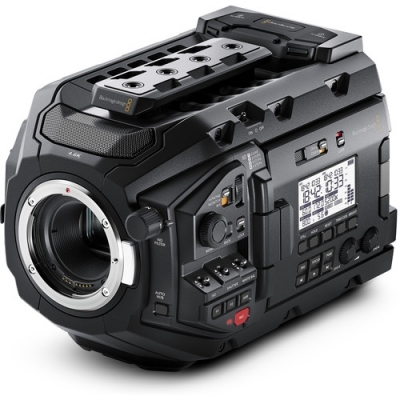 Blackmagic Design's URSA Mini Pro 4.6K Digital Cinema Camera brings ready-to-edit industry standard Apple ProRes recording to a versatile camera body design. Internal ND's are available on a fast-access filter wheel, and most critical camera settings are available for adjustment on dedicated switches. An external LCD provides setup information at a glance. You can choose between Cfast media for the highest resolution recording modes (including Cinema DNG RAW), or shoot on SD cards for affordable long record times at lower resolution. EF, PL and even broadcast B4 mounts are available. Your production can use almost any of MPE's lenses with this versatile camera.